The $99 two-year contract price of the Nokia Lumia 900, as well as its April 8 launch have been confirmed for the Nth time, this time by the so-called VizagDude, who shot a video in an AT&T store handling the phone. There are some kids making noise in the video and a woman who tells him jokingly "Please don't run away with it", so the video looks pretty credible. 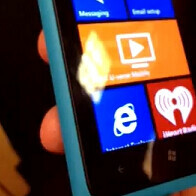 There is a Heart Radio live tile on the phone's screen, and no emails or anything seem to be set yet, thus it might be indeed a fresh out of the box unit. A possible $99 price tag for a nice LTE handset might very well spearhead sales, especially if the rumored millions Nokia and Microsoft are giving AT&T to make the Lumia 900 a default device of frontline employees turn out to be legit. Why stick the word iPhone in every damn thread on PA? Can we talk about other devices without making this become another war, please?